Gay marriage opponents should "just get over it" because you "can't stop two adults from getting married"
Cue: "The Greatest Love of All," because the children are, in fact, our future. 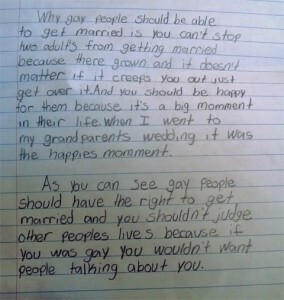 A fourth-grade schoolteacher asked students to write a persuasive essay for a recent assignment, and one of those students chose marriage equality as his topic. What happened next was so good that the teacher had to post it to Reddit so the rest of us could enjoy it. Why gay people should be able to get married is you can't stop two adult's from getting married because there grown and it doesn't matter if it creeps you out just get over it. And you should be happy for them because it's a big momment in their life. When I went to my grandparents wedding it was the happies momment. As you can see gay people should have the right to get married and you shouldn't judge other peoples lives because if you was gay you wouldn't want people talking about you.